Orcs have overrun the countryside of the small coast town of Riva. A dwarven mine in the countryside has been occupied by a mysterious orc chieftain who seems to be of an unusually high intelligence. For an inexplicable reason, the city authorities refuse to acknowledge the danger. And rumors of a group of traitors in the city's slum districts surface. A party of adventures arrives in the town and tries to investigate these troublesome occurrences. 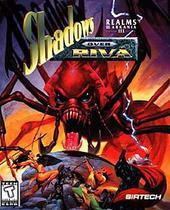 Shadows over Riva is the third and final part in the Realms of Arkania trilogy, and the only one shipped exclusively on CD-ROM and featuring SVGA graphics as well as a smooth-scrolling 3D world. All other aspects of the game are very similar to its predecessors: the player generates a party of characters of various classes, roams the game world from a first-person view, and engages in turn-based combat displayed on separate isometric screens. Changes mostly include fine-tuning such a more streamlined inventory management and integration of area graphics into battle screens.